Vijayshinva Karnure wrote a very cool article about running Server 2008 as a desktop os or rather as a Windows Vista replacement. It seems that besides additional features like Hyper-V, Server 2008 runs approx. 20% faster than Vista. If only upgrading Vista to Server 2008 would be possible… (has anyone ever tried)? 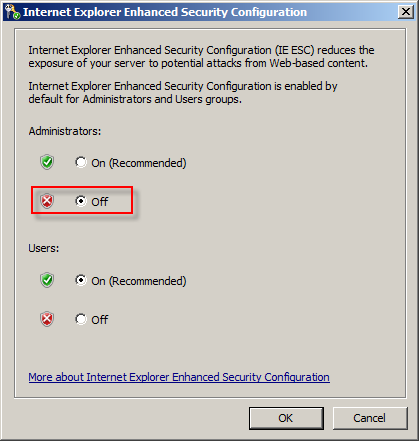 How to deactivate Internet Explorer Enhanced Security Configuration in Windows Server 2008? Open Server Manager and in the Security Information tab click Configure IE ESC. An improvement in Server 2008 is that you can disable it for Administators but enable it for Normal Users, this is nice for Terminal Server and Citrix environments. How to install Powershell in Server 2008? Even though Powershell is included with Windows Server 2008 it’s not installed by default. You can do this in Server Manager by going to Features and then Click Add Features in the Tasks bar on the right. Select Windows Powershell in the list and there you go!